PS2 ports were old connection ports, much like the USB ports of today, and came with early IBM computers. The port allowed you to connect peripheral devices like a keyboard and mouse with the computer. If you owned a computer back in the 90s you would remember the circular port with holes where pins with the keyboard or mouse used to fit in precisely. With the arrival of USB ports, the PS2 ports went out of fashion. However, if you still have a PS2 mouse or keyboard lying around, it is much cheaper to purchase a PS2 to USB port (around $5) than a new keyboard or mouse. Moreover, if you have a laptop, using a mouse on it can be much more convenient than the onboard mouse pad. Using the laptop’s mouse pad extensively can lead to repetitive strain injuries, not to mention the wear and tear due to frequent use. A full-fledged keyboard will also give you more room to type when working on your laptop and prevent the laptop’s keys from wear and tear or discoloration, effectively extending your laptop’s life. Now if you are convinced, the following steps will tell you how you can use your old keyboard and mouse with your new computer. 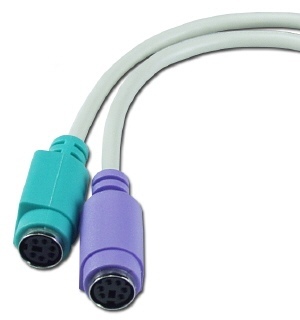 First of all you need to purchase a PS2 to USB convertor from your nearest computer hardware store. While these convertors are fairly cheap, they can be hard to find now that they are of very limited use. Once you have a convertor, simply plug its USB end into the USB port of your computer (your computer can be switched on during this, there is no problem with that). Now take the wire from your PS2 keyboard or mouse and look at the pins at the end. Hold up the other end of the PS2 to USB convertor and align the holes on the convertor’s end with the pins on the keyboard or mouse before connecting them. Once the keyboard or mouse is connected with the PS2 to USB convertor, Windows will automatically detect the device and install the relevant drivers. Once that is completed, you might see a notification in the tray on your task bar and your device should be operational now.